Dylan Thomas was one of the most extraordinary poetic talents of the twentieth century. Poems such as ‘Do not go gentle into that good night’ regularly top polls of the nation’s favourites and his much-loved play Under Milk Wood has never been out of print. Thomas lived a life that was rarely without incident and died a death that has gone down in legend as the epitome of Bohemian dissoluteness. In The Three Lives of Dylan Thomas, journalist Hilly Janes explores that life and its extraordinary legacy through the eyes of her father, the artist Alfred Janes, who was a member of Thomas’s inner circle and painted the poet at three key moments: in 1934, 1953 and, posthumously, 1964. 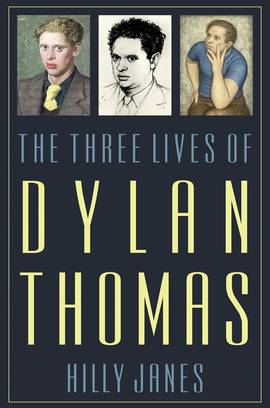 Using these portraits as focal points, and drawing on a personal archive that includes drawings, diaries, letters and new interviews with Thomas’s friends and descendants, The Three Lives of Dylan Thomas plots the poet’s tempestuous journey from his birthplace in Swansea to his early death in a New York hospital in 1953. In this innovative and powerful narrative, Hilly Janes paints her own portrait: one that ventures beneath Thomas’s reputation as a feckless, disloyal, boozy Welsh bard to reveal a much more complex character. Hilly Janes has written the best of the many books about Dylan Thomas which I have read. A marvellous, intimate portrait of Dylan… Hilly’s generous personality infuses the pages and makes them come alive like a latterday Milk Wood. Hilly has produced a book of warmth and great integrity, bringing new light to a subject that has almost been over exposed. A huge bonus is the introduction to a whole a new audience, of the wonderful work of her father, Alfred Janes. Jane’s daughter, Hilly, delves beneath the conventional image of Thomas as the irresponsible and inebriated Welshman, to reveal a more complicated individual, and is the first to examine in full the effect his death, aged just 39 had on his family. An excellent take on a complex subject. What makes this book so readable is the fact that it offers rather more than Dylan Thomas and his insalubrious escapades... Her analysis of his literary legacy is deft, but almost the most delightful thing about this book is its tribute to her talented father, who died in 1999 and was clearly a man of integrity. 5/5 Drawing on a vast personal archive and interviews with friends and relatives, this portrayal goes beyond the stereotype of the boisterous Swansea swaggerer. Brisk and sympathetic, its greatest interest is its account of Thomas’ posthumous legend. He was half stifled by his own mythography … This is why it is helpful to have a memoir like Hilly Janes: Thomas becomes human again, not a doomed Dionysus. The Three Lives of Dylan Thomas is a great read. It doesn’t pull any punches when it comes to his complex life with his wife … Loved it. No-one is likely to publish a biography of Thomas demonstrating that he was a monogamous and placid soul who could hold his drink and manage his money. But Janes simply sets him in the context of a group of variously gifted Welsh friends … and gives some sense of how and why – exasperating as he undoubtedly was – he retained their love and (intermittently) tolerance. [An] attractive and level-headed book. Although uncritical, Hilly’s honest account of Dylan’s life gives us a captivating picture of a flawed genius. She captures the thoughtfulness below the flamboyance.